Christmas has past and I wanted something to replace my holiday decorations and brighten my décor through the winter months. 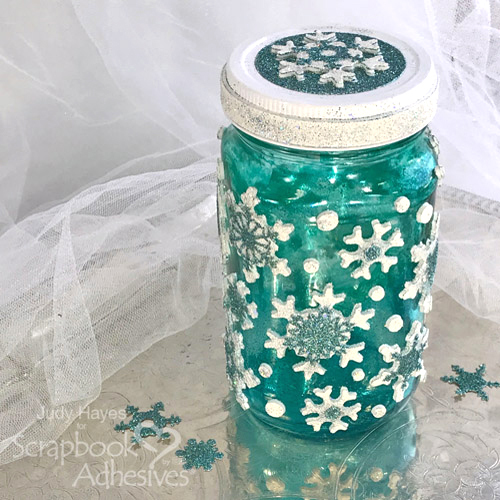 For me, winter means snow, so I made this Glitter Snowflakes Jar in my favorite color with 3D Foam Snowflakes and Adhesive Sheets 4 x 6 inch. It can be used as a home décor piece as it is or with little battery LED lights or a candle. Even empty it sparkles! It would be pretty filled with cotton balls! 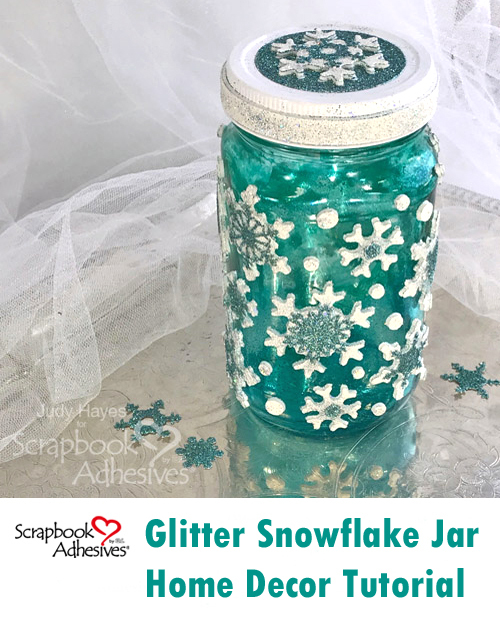 I chose to use a recycled clear jar for my Glitter Snowflakes Jar. Color was added to the inside with alcohol inks. That step can be skipped by using a colored jar. I used 3D Foam Snowflakes along with 6 different small die cut paper snowflakes. I chose snowflake dies that fit the 3D Foam Snowflakes. 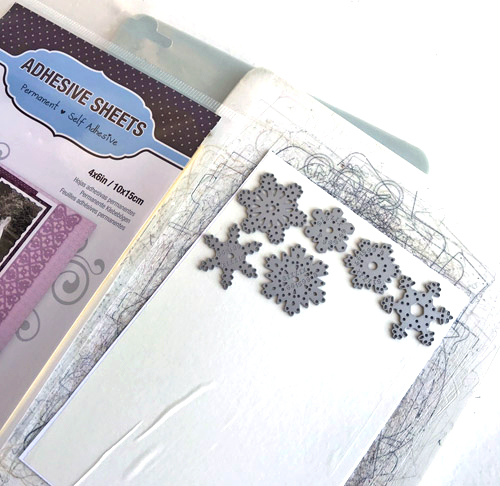 For the die cut snowflakes, apply Adhesive Sheets 4 x 6 inch to white cardstock on one side. 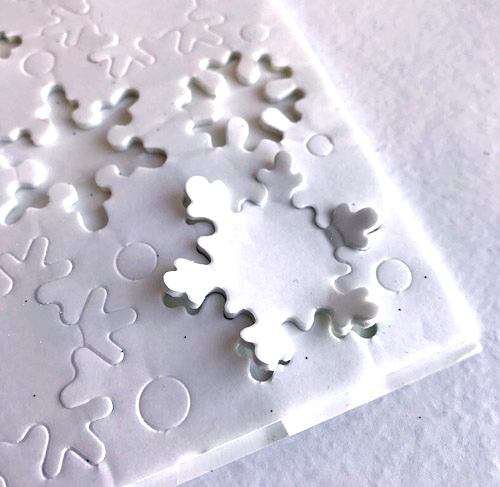 Cut several snowflakes of each design with dies placed on side of paper with Adhesive Sheet. That will be front side on the jar. 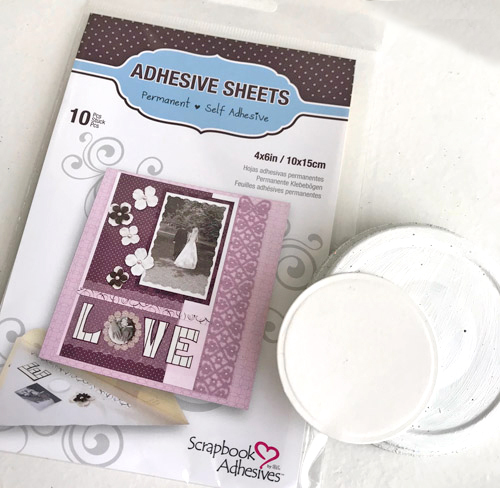 Tape may be needed to hold dies in place as the Adhesive Sheets liner is slippery. 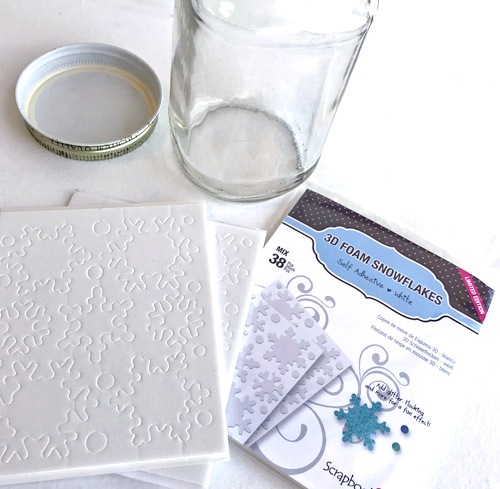 The next step is to place 3D Foam Snowflakes on the jar. To remove snowflakes from sheet, gently lift each point and then remove the whole snowflake. That method keeps the snowflake from getting too distorted. 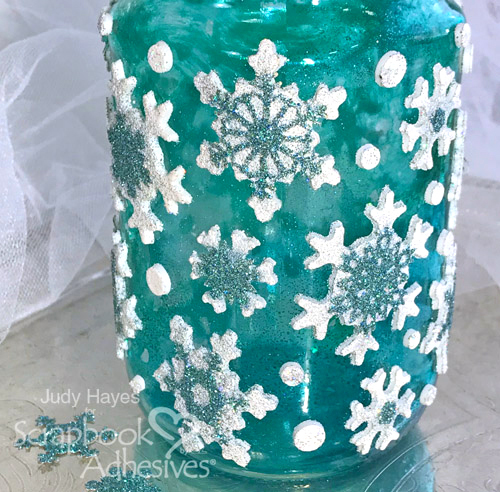 Place 3-4 snowflakes at a time on the jar. Remove the liner from each 3D Foam Snowflake and place a paper snowflake on each one. I varied the styles to add variety. Do not remove liner on paper snowflakes yet! 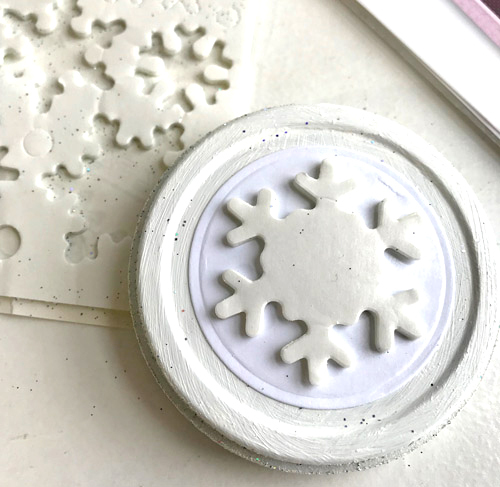 Cover each with embossing powder and press it into the foam snowflake and shake off the excess. 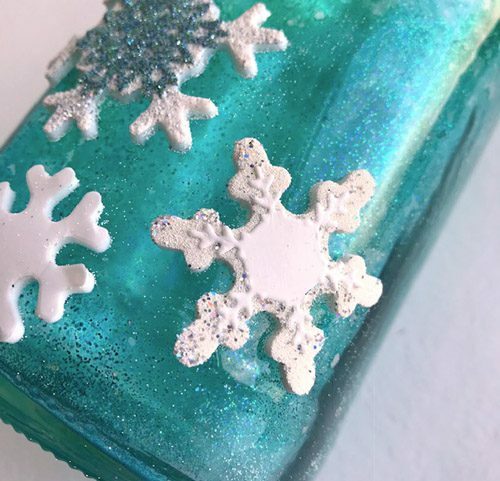 Use a dry paint brush to remove excess around snowflake points as it tends to cling to the glass. Paint jar lid white and wrap Crafty Foam Tape White around lid edge. Remove the liner and cover with embossing powder. Heat to emboss. 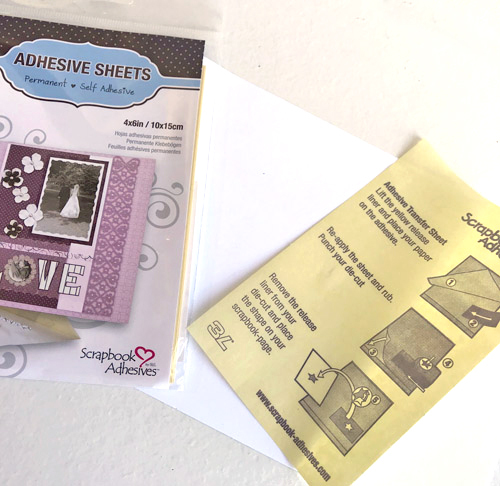 Apply Adhesive Sheets 4 x 6 inch to both sides of piece of white cardstock. 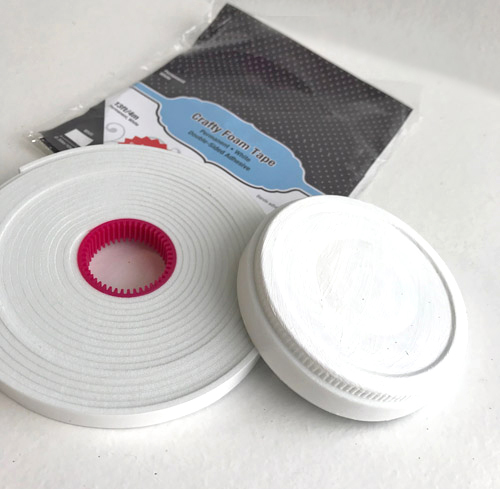 Die cut circle to fit jar lid. Peel liner from back side and fasten to jar lid. Remove liner from top side. Place large 3D Foam Snowflake on circle. Do not remove liner from snowflake. Remove liner from 3D Foam Snowflake and place die cut paper snowflake on it with adhesive liner side up. Do not remove liner from paper snowflake yet. 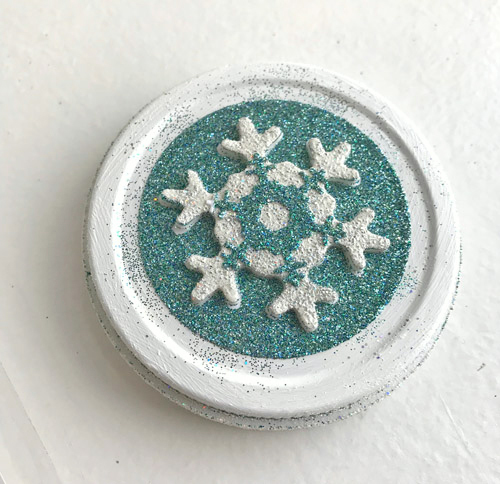 Sprinkle with embossing powder. 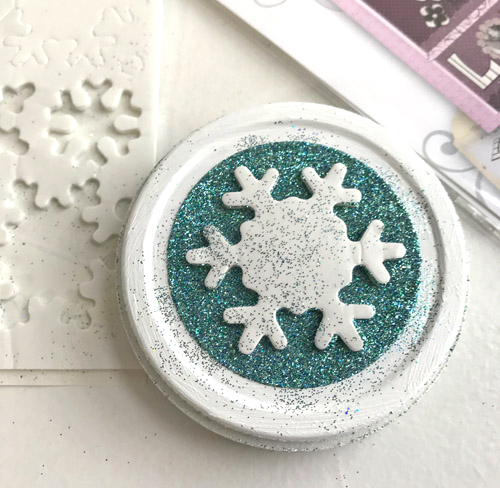 Remove liner from small paper snowflake and sprinkle with glitter, then heat emboss. These are same steps I used for snowflakes on jar. It has 19 snowflakes on it. That completes Glitter Snowflakes Jar! I hope you enjoyed this project! This entry was posted in 3D Foam Shapes, 3D Projects, Adhesives, Crafty Foam Tape, Gifts, Home Decor, Intermediate, Wear your Adhesive on the Outside, Winter and tagged 3D Foam Snowflakes, Adhesive Sheets 4x6", Crafty Foam Tape White, DecoArt, Home Decor, Judy Hayes, mason jar, Ranger Ink, Sizzix, Snowflakes, Sparkle N' Sprinkle, Spellbinders Paper Arts. Bookmark the permalink.